Earth’s Best is a popular brand of milk that is designed to help infants get the optimum nutrition despite having sensitive digestive systems. Babies should receive the necessary nutrients that they need to grow and develop well from their milk formula since they can hardly tolerate solids during the initial months of their lives. A formula that provides the needed nutrients that is gentle to baby’s digestion is a life saver and these features could be found in Earth’s Best Sensitive formula. What it Earth’s Best Sensitive formula? Earth’s Best Sensitive Formula is from Earth’s Best that has created foods and milk formulas that are made without traces of chemicals and additives that could be harmful for baby’s health. For babies that have sensitivities to cow’s milk, this formula could replace regular milk since it is patterned after breast milk in terms of whey/casein ratio, nutrient content and the absence of any kind of trace chemicals that could harm baby. Earth Best Sensitive Formula is free from dangerous ingredients that are found in some infant formulas such as artificial colors and flavors, preservatives, GEI, growth hormones, antibiotics, pesticides or herbicides and steroids. This formula contains nothing but pure, organic and safe milk. What are the benefits of using this Earth Best sensitive formula? Contains a whey/casein ratio that is almost the same as mother’s milk. It also contains carbohydrates, vitamins, minerals and essential fatty acids such as DHA and ARA that are needed for baby’s optimum brain and eye development. It is available in soy or dairy so parents will be able to choose an organic milk that is perfect for their baby’s needs and tastes. What are the advantages of using this baby formula? This milk formula is patterned after breast milk which is advantageous for mothers that simply cannot breastfeed their infants at all. They say, breast milk is the best food for babies when they are rapidly developing since breastmilk contains all the vital nutrients that developing babies need. Breastmilk naturally contains DHA and ARA that are needed in the natural development of baby’s brain and eyes. Breastmilk also contains easily digestible proteins which will never hurt baby’s digestive system at all. Earth Best Sensitive formula is also developed to be just like breast milk when it comes to being easily digested. Regular milk formula that contains hard to digest proteins could lead to colic, abdominal distention and abdominal pain in babies with sensitive digestive systems. It is also a fact that indigestion could also lead to diarrhea or constipation which could affect how baby develops. Babies that cannot tolerate cow’s milk develop abdominal pain, colic and gas which is very painful. Most babies cry, get upset, tend to lose sleep and become very irritable which could also affect the way they adjust with their environment. Changing their milk formula into something more tolerable such as Earth Best Sensitive formula could get rid of all these symptoms and help baby adjust effectively for proper physical and mental development. This is an FDA-approved milk formula so parents and caregivers can guarantee that they are using only the safest and the most nutritious milk formula that they could give to their infants with sensitive digestive systems. 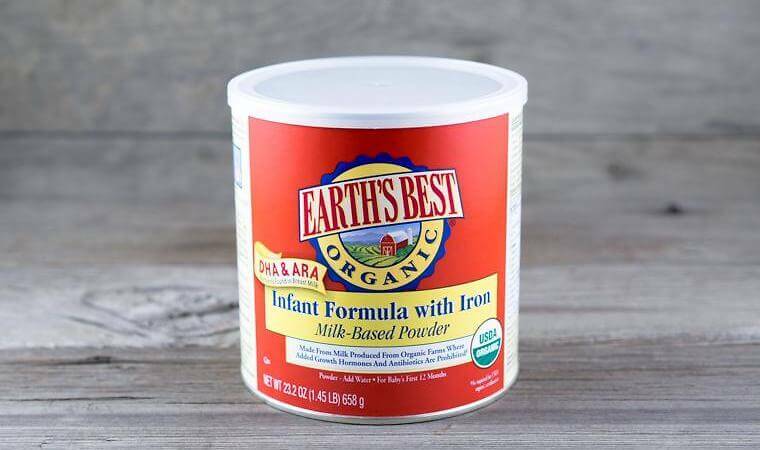 Earth’s Best is approved by the FDA because it meets all the requirements needed for optimum infant nutrition and for having an iron-fortified formula. This milk formula is made by Earth’s Best so it means that it is not just organic but it does not contain any dangerous chemicals that can make baby sick and affect his development. It does not contain growth hormones, steroids, antibiotics, pesticides or herbicides, flavor enhancers and artificial colors. This means that even sensitive babies will be able to tolerate this milk formula. It is easy on the budget too. 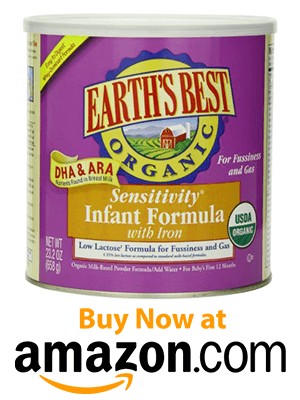 The Earth Best Sensitive Formula with iron in 23.2 ounce cans is available for only $24.22 at Amazon.com. this is a savings of 5% from its actual price from other online and offline stores. Special promos and free shipping will further help parents save on milk formula. Are there any disadvantages to its use? As far as online reviews are concerned, most parents that have tried using Earth’s Best Sensiive formula on their babies have had great results with it but some find the smell and the flavor intolerable. Infants that do not like the smell and the taste of this milk however does well when this is mixed with other food or beverage. A number of parents also reported that their infants suffered from constipation after using this formula while some had foul smelling stools. Definitely organic does not mean that this formula is for all babies. There are still babies that have extra-sensitive digestive systems which cannot tolerate even organic formulas. Still consulting a doctor is still the best way to find the most suitable milk formula for babies and infants. While this formula is considered one of the most affordable, still some users find it expensive. Taking advantage of promotions and discount offers may be able to help augment the cost of buying Earth’s Best Sensitive formula. The Earth’s Best Sensitive Formula is a great alternative to breast milk since it has been designed to mimic breastmilk. It is easy to digest as breast milk and also contains the right amounts of DHA and ARA that are crucial in developing baby’s brain and eyes. This formula is free from any kind of dangerous chemicals, growth hormones, antibiotics and preservatives which makes it ideal for the use of babies with delicate stomachs. There are other milk formulas out there with better taste and price but Earth’s Best is considered the most complete and ideal replacement for breast milk.